[The village of] Pisky, in my subjective opinion and in terms of equivalent pounds of TNT, has not been inferior to the Donetsk airport for a long time now. I think, in terms of the numbers of mines and shells arriving here virtually around the clock, they top it. It’s just that the density is different and there are some specifics. Pisky equals the airport. If control over Pisky is lost, the ability of our guys to effectively defend the airport will be measured by hours. And the terrorists know about this. This is exactly why kilotons of explosives fall on our guys’ heads. The airport is almost in complete isolation. Every second there is preparedness and cold. In Pisky it is warmer. There are abandoned houses, there are basements. And there is the illusion of safety. The sky can fall on your head at any second with a 30-50 kilogram shell filled with explosives. There are simply no houses with the glass undamaged. Some streets are open to snipers along their lengths. Of late, the main way of life has been [living] in the basement. 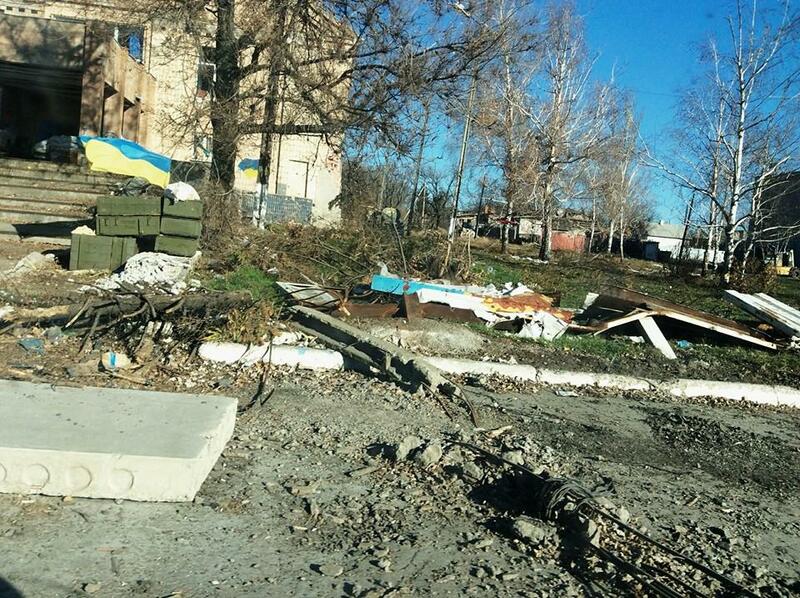 After every humanitarian convoy the activity of enemy artillery increased several times over. But for the past few days, it was something unimaginable. The day before yesterday, it seemed like the separatists had the task of pummelling the village into the ground. The whole sky really was black from explosions. Yesterday there was half a day of quiet and then shelling resumed. They hit Tonenke too. Why the question of returning fire was being debated until 4 in the morning is for me a mystery. 12 hours of intense artillery fire on our positions, and our commanders are deciding whether to allow return fire or not. And every incoming shell, rocket, mortar, is maybe someone’s death. And they pour on the full package with small intervals for reloading and correction. There are many things I do not understand in this war. But when our guys are being shelled for about 12 hours, and we are silent, this one can’t comprehend. In Pisky, because of the active basement life, there is a greatly increased need for diesel generators and battery lanterns and lamps. Everything works from generators, heat too; there is no possibility to go out looking for firewood. There is also a little-known unit in Kharkiv, the joint supply centre for the ATO. They are our subordinates and great friends. They never ask for anything, refuse help, they say – we are not fighting, let’s drive this down to our guys. They simply deliver everything that the army needs. From food to fuel and motor oil. Under fire and in any weather. But they believe that they simply drive and deliver all the essentials. It’s that simple. But they also need help sometimes. And they need help now. Rather, not for them as such, but so that they can deliver the supplies to the front better. They need chains, about 500 metres. To weld snow chains onto the wheels of every vehicle. Want to help with the victory? It is easy. And yes, a repost is also help. Anti-flu, anti-common cold, anti-cough medicines. Thermal socks, army olive sweaters, long socks to wear around the throat, fleeces. Gore-Tex costumes. Thin wool gloves. Looking for them gifted i.e. for free. Call 093 487 99 36 Roman. Parcels can be sent to Kharkiv by new post. Kyiv, 19 Myropilska St., (subway station “Chernihivska”) fitness club “Doberman, tel. 093-9025825 Anastasia. Odesa, 103-a Levitana St. Tel. 0984387356 fitness club “Malibu”. Parcels can be sent to Kharkiv by new mail. Now paid for by the beneficiary. This entry was posted in English, English News, Help for ukrainian army, Others, South&Eastern Ukraine, War in Donbas and tagged #RussiaInvadedUkraine, #UkraineUnderAttack, Donetsk, Pisky, Ukraine, war in Donbas. Bookmark the permalink.